Yellowstone National Park occupies an area of 3,472 square miles. It is home to the Yellowstone Lake which is one of the largest high altitude lakes in North America. The lake sits of Yellowstone Caldera, the largest supervolcano in North America. The national park was established on March 1, 1872, by President Ulysses S. Grant. It is well known for its dense concentration of mud pots, steam vents and hot springs. It has more than 500 active geysers and ‘Old Faithful’ is the most famous of all of them as it is capable of spewing 180 feet into the air. Yellowstone National Park is the world’s first national park. Around 4 million people visit the park every year. This national park experiences approximately 1,000 to 3,000 earthquakes every year. 80% of the land is covered by forest, 15% is grassland, and 5% is water. This park is home to the largest hot springs which are called the Grand Prismatic Springs. One of the earliest explorers to the national park was stranded there for 37 days. This National Park is also a designated World Heritage Site and designated Biosphere Reserve. With an area of 28,000 square acres. It is the largest intact temperate ecosystem in the world. It is also home to Steamboat, the world’s tallest active geyser. It can erupt more than 300 feet. John Colter was the first white man to see Yellowstone in 1807. He was a member of the Lewis and Clark Expedition. There are more free-roaming wildlife in Yellowstone National Park than in the all 48 lower states combined. You will find: Moose, Wolves, Bears, Coyote, Bobcats and may more. Eagle Peak is the highest point in the park at 3,462 m.
Reese Creek is the lowest point of the park at 1,610 m.
80% of the park is covered by forest. Yellowstone lake has 141 miles of shoreline and is 20 miles long from north to south. 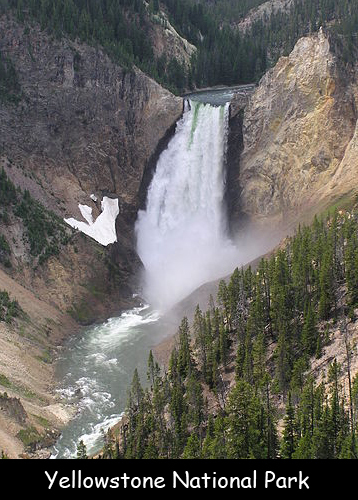 Yellowstone is home to many waterfalls, up to 290. The tallest waterfall in the park is the Lower Falls at 308 ft.
Declan, Tobin. " Fun Facts about Yellowstone National Park ." Easy Science for Kids, Apr 2019. Web. 18 Apr 2019. < https://easyscienceforkids.com/yellowstone-national-park/ >.